The name is derived from the Latin 'silex' or 'silicis', meaning flint. 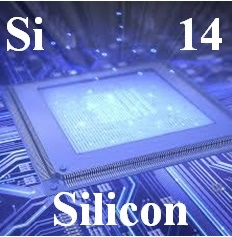 Silicon is the second most abundant element after Oxygen. It is usually found as a portion of something else, in much the same way oxygen is. Quartz crystal is, in fact, SiO2! Silicon, when purified by man, is a pure element energy, and though "manmade" does have mystical energies, just as Silicon lends its energies to the minerals and other things it is a part of. My initial take on Silicon was that it had energies of enhanced communication, agility of thought, and grace. After more research and time with the element, I've discovered more about Silicon. Silicon is also used to enhance and sharpen mental activity and focus. It is also said to promote discrimination in the sense of being able to sort out the truth from a great deal of possibly conflicting information. When using Silicon, many have found that its energies promote and accentuate positive energies for all situations. Silicon is said to be a great healer, and by some is called a "Master Healer" stone. Physically it is said in crystal healing to help with headaches, eyestrain, as well as repetitive motion injury and other difficulties related to overuse of computers. It is also said to be a great vitality booster, and help strengthen bones and teeth. In crystal healing it is sometimes used to purify the body and mind, and is helpful for enhancing manual dexterity. It is also said to promote increased memory and possibly help with Alzheimer's disease and other dis-ease states that affect the memory negatively. Silicon is used in making computer chips that drastically improve processing time and accesses memory faster and Colloidal Silicon helps your body do the same. Are you over do for an upgrade? This is made from 10ppm Ionic Colloidal Silicon as a base. Then I preformed the John Hudson method by adding Organic Dolomite and swinging the PH. 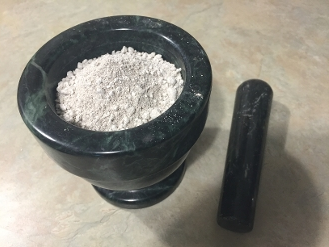 Then after washing it 7 times and drying it out, it is now a fine white Ormus powder that is extrememly high in Silica.